There were excellent wins for Kilmarnock, St Johnstone, Dundee, Dundee United and Hamilton today. But top billing goes to Inverness who beat Celtic 1-0 to stay top of the pile. John Hughes's side are unbeaten in four games and are yet to concede a goal. That's enough from me. Enjoy the rest of your weekend and thanks for your company on another action-packed Saturday. Online highlights of the games will be available from 18:00 BST tomorrow. "Kilmarnock were excellent and in complete control. It was a complete cruise. I can't believe Josh Magennis didn't get on the scoresheet; he had three great chances in the first half and another right at the end. "Motherwell could do with some of the character shown by their Lanarkshire rivals Hamilton." "We were in total command of the game and had two open goals we haven't taken at 1-1. Performance-wise I thought we were excellent. Dundee United have stolen the points today and that has been the story of our season so far." Anonymous: "So much for the Sportsound team saying that Aberdeen would be up there this season - once again wrong." Sheelagh: "Hamilton are showing incredible fight and bravery at the start of the season. They will stay up without a doubt. Top effort boys!" "I thought we were quite indulgent in our play, knocking it around without causing them problems. St Johnstone are aggressive and very well organised but we had a couple of opportunities, so it's a poor afternoon's work for us." "I think Partick Thistle just switched off after they scored, thinking it was job done. I tipped Accies to go down and I think I've got that one spectacularly wrong." "Steven MacLean is a leader for us on and off the pitch. He knows how to link play and he probably doesn't get enough goals due to all of the unselfish work he does outside the box. We were competitive from the first whistle and that helped us." "St Johnstone were the better team over the 90 minutes. In the first 30 minutes they totally dominated. The Dons did come back in that first half but in the second half there wasn't much flowing football from either side. Steven MacLean was outstanding again in that lone striker's role, he set up a number of chances and got the crucial goal." And what about the Championship - did you all think Queen of the South would be above Rangers and Hibs would be in eighth place? Hearts are looking good value at the top after demolishing Raith Rovers in Kirkcaldy. What a flurry of late goals! Dundee striker Peter MacDonald was among the scorers in the final few minutes giving Paul Hartley's side their first win of the season. St Mirren and Ross County are stuck at the bottom of the table, without a point. I think that means the Accies are up to second in the table as veteran striker Jason Scotland steals in to steal the points. John: "Aberdeen are really struggling at the start of this season that promised so much." Well, the Jags lead didn't last long as Hamilton substitute Tony Andreu strikes the ball from 12 yards to beat Jags keeper Paul Gallacher. Dundee United substitute Chris Erskine catches Antonio Reguero off his line with a smart left-foot shot. Gary Mackay-Steven finds John Rankin, who draws a block from Ross County goalkeeper Antonio Reguero. It's not been much of a game but Kallum Higginbotham delivers a moment of real quality with a blistering shot on the volley from 25-yards out, leaving Michael McGovern rooted to the spot. Peter Pawlett is booked for diving this time. He was warned earlier on and after he hits the deck again this time Craig Thomson reaches for a card. Saints are ahead as Steven MacLean breaks the deadlock at McDairmid Park. Michael O'Halloran's cross wasn't great but the Dons defence don't deal with it and the experienced striker strokes the ball into the net. Peter MacDonald takes down a long ball calmly slots into the net to give Dundee the lead. Could they be on their way to their first league win of the season? Ross County scorer Jake Jervis shapes to shoot in the six-yard box but gets it all wrong, the ball going high over the bar. Is that game over in Ayrshire? With the Steelemen down to 10 men, Sammy Clingan rubs further salt in the wound by netting from a free-kick. The visiting fans want a penalty as Craig Wighton goes down under a hefty challenge from Ellis Plummer but play is waved on. The visitors are down to 10 men as Fraser Kerr is sent for an early bath for a dangerous challenge on the edge of the penalty box. It's a first sighting for the St Johnstone fans of new signing Simon Lappin as he comes off the bench. Can he make an impact with the game stuck in a stalemate rut after such an exciting first half? Motherwell's Henrik Ojamaa dispossesses Killie defender Mark Connolly and bears down on goal, but fails to get his shot away before other defenders tidy up the Irishman's mistake. BBC Scotland's Chick Young at Firhill: "There's more chance of seeing a unicorn, a woolly mammoth and Lord Lucan than a goal, the way this match is going." Dundee United are eager for a second and Mario Bilate threatens with a fierce shot before an offside flag curtails the Tangerines' latest foray forward. Dundee hit back straight away with a swift move up the park and a shot from Dundee substitute Peter MacDonald but Marian Kello is equal to it with a stretching save. Former Aberdeen captain Willie Miller on BBC Radio Scotland: "Aberdeen have had the bulk of possession in this second half but haven't done anything with it. Neither side are creating any chances since the break, it's just so tight in the midfield." Peter Pawlett hits the deck but referee Craig Thomson deems it a dive. He doesn't book the Aberdeen midfielder, who has previous in this department, but does take the opportunity to have a quiet word in his ear after a break in play. Mario Bilate drifts away from his marker and gets in a shot but the Dundee Untied forward cannot find the net. St Mirren striker Calum Ball threatens again with a wicked shot that fizzes across the face of goal. He's looking lively up front for the Buddies. Take a bow James Keatings! The Hearts forward curls in a fabulous free-kick for his hat-trick. The Tynecastle side lead 3-0 at Raith Rovers. Rangers are also 3-0 up on Dumbarton, with Nicky Clark on target. Fresh from that fine save, Michael McGovern almost blunders by dropping a simple cross ball but the Accies keeper recovers well to save his blushes. County are back in the game at Tannadice as Jake Jervis stabs the ball home at the back post following a delivery from Graham Carey. Accies keeper Michael McGovern flies across his goal to keep out a smart shot on the turn from Steven Lawless. "Allan Johnston's Kilmarnock are well worth their 1-0 lead and to be honest it should have been a bigger lead they took to the home dressing room. However, opposition goalkeeper Dan Twardzik has played a huge part in keeping Motherwell's deficit to a solitary goal. "The Steelmen put more pressure on the Killie defence towards the end of the first-half, but are struggling to contain a very lively looking Josh Magennis, who is at the hub of most home attacks." BBC Radio Scotland's Jim Spence has been unusually quiet on Open All Mics, just the odd 'ooh and aah' from Tanandice. We have had one goal, though, and it came from the head of Dundee United striker Nadir Ciftci. Rangers and Hearts have doubled their leads, with Darren McGregor hammering in a shot against Dumbarton at Ibrox and James Keatings grabbing his second for the Jambos at Raith Rovers. Partick Thistle's Gary Fraser embarks on a powerful run and a thumps in a shot from the edge of the penalty area that Accies keeper Michael McGovern manages to block. BBC Scotland's Richard Wilson at St Mirren Park: "Fairly even so far. Both sides playing composed, passing football, and there are threats in both attacks." BBC Scotland's Kenny Crawford at Rugby Park: "Rory McKenzie is next to test Motherwell goalkeeper Dan Twardzik from distance, as he zips in a low strike which the Czech tops round the post for a corner. "Motherwell have been better this last five minutes but are struggling to create anything clear-cut. But their fans are still banging their drums in the away section." This time Aberdeen hit the frame of the goal. Shaleum Logan crosses from the right to Andrew Considine who bullets the header off the crossbar. Steven Anderson then nearly puts the rebound into his own net but manages to scramble it away for a corner. Brothers Paul McGinn (left) and John McGinn in action for Dundee and St Mirren, respectively. "I was upbeat about this game, thinking we would get a good match. But it's been start-stop, very scrappy - and players can't seem to find their team-mates. The first few minutes were fine, but since then it's really not been very good at all." Gary MacDonald is the latest St Johnstone player to pass up the chance to open the scoring. This time Dons keeper Jamie Langfield spills the ball and the former Aberdeen man puts the loose ball wide of the post. A poor passback by Jonny Hayes gifts Steven Maclean the chance, but he hits the post. Both players apologise to their team-mates. It's a first goal of the season for Nadir Ciftci as the striker rises unchallenged to head Dundee United into the lead. "Josh Magennis has two glorious chances to extend Killie's lead but 'Well keeper Dan Twardzik twice denies him brilliantly. "The Czech goalie, whose brother Filip played for Celtic today, smothers Magennis's first effort from close range before palming away another right-foot shot by the Northern Irishman." Dundee nearly find the net after some neat play, but former Buddie Gary Harkins pauses on the ball too long and can only drag a shot wide. A quick dip into the Championship to see how the big boys are doing. Hearts and Rangers are in front against Raith Rovers and Dumbarton with goals from James Keating and Lee McCulloch, respectively. Hibs, on the other hand, are trailing at home to Falkirk thanks to a smart Rory Loy finish. Half chance for St Mirren as Adam Drury picks up the ball from a throw-in and volleys in an effort, but he can't find the target. "What a strike from 18-year-old Robbie Muirhead, thumping it into the top left corner from 25 yards. The ball broke to him after a throw-in and I don't think Motherwell goalkeeper Dan Twardzik was expecting him to shoot... but shoot he certainly did!" St Johnstone are looking for a penalty when Dave Mackay hits the deck as David Wotherspoon's ball whizzes across the face of goal. Referee Craig Thomson is uninterested though. Killie are ahead thanks to a long-range belter from Robbie Muirhead. Great play from St Johnstone forward Steven MacLean who manages to thread the ball through to David Wotherspoon. The former Hibs man maybe should have taken a touch first, but his composure deserts him and he puts his shot wide. Hamilton's Louis Longridge takes the ball down the left and fires in a fierce shot which Partick Thistle keeper Paul Gallacher turns round the post for a corner. Dundee win a couple of early corners and cause a few problems in the St Mirren penalty box, while Buddies midfielder Kenny McLean breaks away only to blaze wide from a promising position. Sportsound - Open all Mics is available on BBC Radio Scotland 810MW, DAB digital radio and online. Commentary of St Johnstone v Aberdeen is available on BBC Radio Scotland 92-95FM and online. Click the 'Live Coverage' tab to listen online. Kick-off approaching all around the country. We have blue skies over Firhill for the Partick Thistle v Hamilton contest. "We rode our luck a couple of times in the first half but we created a few chances ourselves. Then we got our goal, maybe too early. I like a goal in the 85th minute against Celtic. But we coped well, changed our shape, played on the break and could have nicked another one. "We want to win as many games as we can as quickly as we can to make sure we stay in the Premiership, then we'll set about reassessing out targets." Dundee United: Cierzniak, Watson, Townsend, Morris, Fojut, Paton, Rankin, Dow, Mackay-Steven, Ciftci, Bilate. Subs: McCallum, Erskine, Graham, Spittal, Telfer, Connolly, Smith. Ross County: Reguero, Celcer, Boyd, Cardle, Brittain, Jervis, Kiss, Arquin, Fenlon, Balk, Carey. Subs: Brown, Quinn, De Leeuw, Maatsen, Boyce, Ross, Frempah. United were torn apart at Celtic Park last week, with manager Jackie McNamara saying his side's defending was "embarrassing". They had gone to Glasgow full of optimism after wins over Aberdeen and Motherwell, so six points from nine against last season's top three is not to be sniffed at. The Staggies have nothing to show for their first three matches. Zilch. County boss Derek Adams has been frustrated by the sloppy nature of the goals conceded so far and will have been working hard on defensive drills. St Mirren: Kello, Naismith, McAusland, Plummer, Tesselaar, Goodwin, Drury, McGinn, McLean, Marwood, Ball. Subs: Osbourne, Kelly, Thompson, Wylde, Ridgers, Teale, Caldwell. Dundee: Letheren, Irvine, Konrad, McPake, McGinn, McAlister, Ferry, Wighton, Harkins, McGowan, Tankulic. Subs: Davidson, McBride, MacDonald, Bain, Stewart, Boyle, Kerr. Brothers John and Paul McGinn go head-to-head in Paisley as the hosts look to get off the mark for the season. Steven Thompson is only fit enough to make the home bench as he waits for his first outing this term but Jim Goodwin is back following his opening day red card. Dundee are unbeaten on their return to the top flight, with three draws and Paul Hartley's men already look at ease in this division. "In the first half we had three very big chances and they had nothing. The second half was more even and we were too passive. I wanted more intensity in the final 20 minutes but Inverness played well, so congratulations to them." Partick Thistle: Gallacher, O'Donnell, Muirhead, Balatoni, Bannigan, Stevenson, Lawless, Higginbotham, Osman, Fraser, Keenan. Subs: Craigen, Doolan, Elliott, Wilson, Lindsay, Duggan, Basalaj. Hamilton Accies: McGovern, Gordon, Canning, Gillespie, Imrie, Crawford, Longridge, Mackinnon, Garcia Tena, Redmond, Antoine Curier. Subs: Hendrie, Devlin, Scotland, Neil, Andreu, Ryan, Currie. These two have not met in the top flight since the 1965/66 campaign, although they are familiar foes having had many tussles in the division below. The Jags took forever to win at home last season but they boast a 100% record this time after demolishing Ross County in Maryhill. That was followed by a draw at Dens Park last weekend. St Johnstone: Mannus, Mackay, Scobbie, Anderson, Millar, McDonald, MacLean, Wotherspoon, Brown, Croft, B.Easton. Subs: Banks, Lappin, Wright, Morgan, Miller, Kane, O'Halloran. Aberdeen: Langfield, Logan, Anderson, Reynolds, Considine, Jack, Flood, Pawlett, Hayes, McGinn, Rooney. Subs: Brown, Shaughnessy, Robertson, Low, Smith, Robson, Goodwillie. Saints had their wings clipped by Hamilton last weekend following a home defeat to Celtic, so the Perth side will be determined not to lose any more ground. The big question is who will get the goals now Stevie May has gone? Aberdeen had a wee rest last weekend. The poor souls were knackered in mid-August and opted to play their joker for a postponement. The Dons should be nice and fresh as they look to add to last season's victory on their one and only visit to Perth. Kilmarnock: Samson, Barbour, Hamill, Connolly, McKenzie, Clingan, Odabeyi, Chantler, Magennis, Pascali, Muirhead. Subs: Brennan, Miller, Johnston, Cairney, Ashcroft, Eremenko, O'Hara. Motherwell: Twardzik, Reid, Carswell, McManus, Sutton, Vigurs, Lasley, Law, Kerr, Leitch, Ojamaa. Subs: Nielsen, Ainsworth, Lawson, O'Brien, McHugh, Thomas, Cadden. "The sun is shining and the seagulls are squawking as they swoop down and inspect this recently laid artificial surface. It's what everyone that comes here seems to be talking about and although it's fine to look at, word on the street is that the players are not keen. "Anyway, there's a game happening here and Killie will be looking to get their first league win on their FieldTurf. They're confident after a good away victory at Ross County last weekend. "Motherwell, on the other hand, visit North Ayrshire on a bit of a downer, having been beaten in their last two matches." No time to draw breath after the Highland drama as we have five more top flight matches almost upon us. Celtic only lost one league match last season and it took until February when they were turned over by Aberdeen. BBC Radio Scotland match commentator Liam McLeod tells us it's the first time Celtic have not scored in the league since December 2012. We've got some Highland rain now just to add to the late drama. Roars of derision go up from the home fans as Celtic skipper Charlie Mulgrew sends an ambitious shot well wide. We'll get three minutes of stoppage time. Can Inverness hold on for maximum points? Ali, Edinburgh: "Hard to criticise Celtic for the numerous changes. Will still win the league at a canter and Champions League qualification is a far greater priority at this stage." Inverness make their final change with Marley Watkins receiving a well-earned round of applause as he is replaced by Aaron Doran. Suddenly Inverness are racing up the park, with three against three and it needs a good strong hand from Lukasz Zaluska to keep out Nick Ross's stinging shot. Inverness are camped deep in their own half now as Celtic prod and poke, looking for an opening, but the visitors lack punch and precision. A dreadful free-kick makes it way back to Anthony Stokes. The Celtic striker fashions room for a shot wide on the left but his second attempt is no better as the ball flies well wide of Dean Brill's goal. Nick Ross is on for Ryan Christie and Liam Polworth replaces Billy McKay as Inverness make a double change for the last 10 minutes. MBEHAN ‏on Twitter: "Celtic paying the price for making too many changes against a decent Inverness side #bbcsportscot"
Celtic keeper Lukasz Zaluska comes charging out to the right edge of the penalty box but can't gather. Efe Ambrose is on hand to clear but Inverness work the ball back into the danger area quickly and a snap-shot from Ryan Christie flashes narrowly wide. What was that Yogi? You'll need to speak up... Inverness are ahead but manager John Hughes will be concerned about his side's inability to hold on to the ball for very long. Anthony Stokes is right in the thick of it right away, stabbing a clever pass into the path of Kris Commons but Dean Brill is down swiftly to make a comfortable save from the midfielder's angled shot. Celtic respond to losing that goal by sending on Anthony Stokes for Leigh Griffiths. This is all about the run and cross from Marley Watkins as he speeds down the right and sends the ball down the corridor of uncertainty. As Billy McKay throws himself at it, keeper Lukasz Zaluska has a flap and it strikes the shins of Eoghan O'Connell before spinning into the net. Kris Commons knocks on a pass and Leigh Griffiths makes a good run to get in behind the home defence but his angled drive is straight at Inverness keeper Dean Brill. Efe Ambrose is no stranger to the right-back position. He plays there often for Nigeria but is it his best position and does it mean Ronny Deila doesn't fancy him in the centre of defence? Inverness relieve the building pressure by winning their first corner since the interval. Josh Meekings gets his head on the delivery but is at full-stretch and can't keep the ball from sailing over the crossbar. Callum McGregor has been lively since his introduction and the Celtic substitute slips a neat pass to Leigh Griffiths in front of goal but the striker's first touch lets him down. Billy Turnbull on Twitter: "Big Yogi seems to have turned ICT around compared to last season but I wont hold my breath." Celtic have upped the tempo further and Inverness are starting to look a little ragged under pressure, with several passes going astray. Celtic substitute Callum McGregor darts in from the right and is sent sprawling by a sliding tackle from Danny Williams. The Inverness midfielder got enough on the ball to banish any fleeting thoughts the officials may have had about a penalty. We're up and running again, with a wee reshuffle for Celtic after those changes. It looks like Leigh Griffiths will play through the middle now, having been out wide for the first 45 minutes. Celtic are back out, with Callum McGregor and Stefan Johansen on in place of Teemu Pukki and Filip Twardzik. Inverness have been sticking gamely to their pass and move style but they are not getting anywhere near the time they had on the ball against Motherwell last weekend. Celtic are pressing hard all over the pitch, with the high-tempo approach favoured by manager Ronny Deila. BBC Radio Scotland's Charlie Mann tells listeners that Ally McCoist is "definitely on a list" for the managerial vacancy at Crystal Palace. He doesn't tell us who's list, however. Would the Rangers boss be keen on a move down south? Isaac Callan ‏on Twitter: "#Celtic looking shaky at best today." Nick Ghamgosar on Twitter: "Good to see Tansey maintaining his form from last week." It's been a open game, with both sides intent on getting forward. Dean Brill has been the busier goalkeeper and Nir Biton came closest to scoring for Celtic with a lovely shot that struck the crossbar. Inverness right-back David Raven swings in a high, looping cross and Lukasz Zaluska, who played just two games for Celtic last season, doesn't look very comfortable under pressure from Danny Williams at the back post. The keeper misses with his punch but the midfielder can only nod off target from a very tight angle. Celtic captain Charlie Mulgrew pops up on his own goal-line to make a vital clearance, nodding away a looping header from Gary Warren, who was found by a Graeme Shinnie corner kick. Inverness full-back Graeme Shinnie makes his way past a slipping Dylan McGeough in the Celtic box but young Eoghan O'Connell gets across to block his path. Celtic midfielder Nir Biton leaves two defenders on their backsides with a lovely change of direction on the edge of the penalty area then lofts a curling strike against the crossbar, with keeper Dean Brill a spectator. ICT's Graeme Shinnie gives Dylan McGeouch a good old fashioned barge in what has been an open first half in the Highlands. Play rages up the park immediately and Kris Commons runs on to a Leigh Griffiths pass on the edge of the penalty box and draws a diving save from Dean Brill with a firm, first-time effort. The home fans are screaming for a penalty as Filip Twardzik sticks out a leg and Ryan Christie goes for a tumble but referee Bobby Madden is not interested. There may have been slight sock-on-sock contact but hardly enough to create a spark of static, never mind cause a man to lose his balance. Celtic striker Teemu Pukki has two bites at the cherry from close range but he can't find a way past Dean Brill, who makes two good blocks at his near post. Kris Commons scored the only goal after three minutes on Celtic's last league visit to Inverness and that was followed by 5-0 and 6-0 defeats for Inverness in Glasgow last season. It's a busy period for Dean Brill as the big former Luton goalie has to tip over a first-time, hooked shot from Efe Ambrose after Liam Henderson aims a free-kick to the edge of the home penalty box. Home keeper Dean Brill looks more confident this time as he clutches a angled drive from Liam Henderson. Dylan McGeough hasn't started a Celtic game since the shock home defeat to Morton in the League Cup last September. The midfielder is on hand as Inverness keeper Dean Brill spills the ball when charging out to thwart Teemu Pukki but he can't escape a defender in blue in the penalty area. Celtic playmaker Kris Commons finds Leigh Griffiths lurking on the right edge of the penalty area and the Celtic forward elects to have a pop rather than cut in on his favoured left side. The shot flies through the legs of a defender but nestles in the side-netting. Greg Tansey has got his shooting boots on today as he leathers in another effort - this time from fully 30 yards - and the ball skids a foot or two wide of the target. MackerOnTheMed on Twitter: "The Tic need to maintain the form we started to see midweek & iron out a few things! Their confidence is rising! Mon The Hoops!" Crispybear1 on Twitter: "Prediction of 2-1 to ICT"
Marley Watkins clearly fancies his chances against Celtic left-back Filip Twardzik. The winger has left him for dead twice already in these opening exchanges. Inverness midfielder Greg Tansey, who scored a great goal at Motherwell last weekend, fires a free kick narrowly wide from 22 yards. The sun is shining in the Highland capital but there's a stiff breeze coming in off the Moray Firth and the fans are well wrapped up as Celtic forward Kris Commons slips when shooting from a tight angle. The mood at Celtic has been lifted dramatically in the last few weeks. The memory of that harrowing defeat from Legia Warsaw is fading after nine goals in two league wins and a very useful draw in Slovenia on Wednesday following a remarkable European reprieve. I was at Fir Park last Saturday and Inverness were impressive as they coasted to victory. Danny Williams, Marley Watkins and Ryan Christie were full of clever runs and slick movement behind striker Billy McKay. The squad may be a little thin but if a tricky customer like Aaron Doran is on the bench, then you know the home side have got a good thing going. Doran scored a screamer late on against Motherwell and Greg Tansey's opener was another excellent strike, so Celtic will need to work hard to close down shooting opportunities. "We hope things will happen this week. I think we'll get things how we want them." The question? How are things progressing with moves for Sporting Gijon's Serbian striker Stefan Scepovic and finalising a loan move for Ghana winger Wasako Mubarak? "I have so many good players and it's important to use the squad. The team is different from Wednesday but it is a very good team. I think we will see a lot of energy today." BBC Scotland's David Currie was soaked on live telly last night. He tells me it wasn't that bad but his gritted teeth suggested otherwise. "This will be a big test for us. We guessed they would make changes but some of the boys coming in for Celtic - I would take them in my team - they have last year's player of the year, Kris Commons. It's all about us though. If we play with the same enthusiasm and look after the ball it should be a cracker." 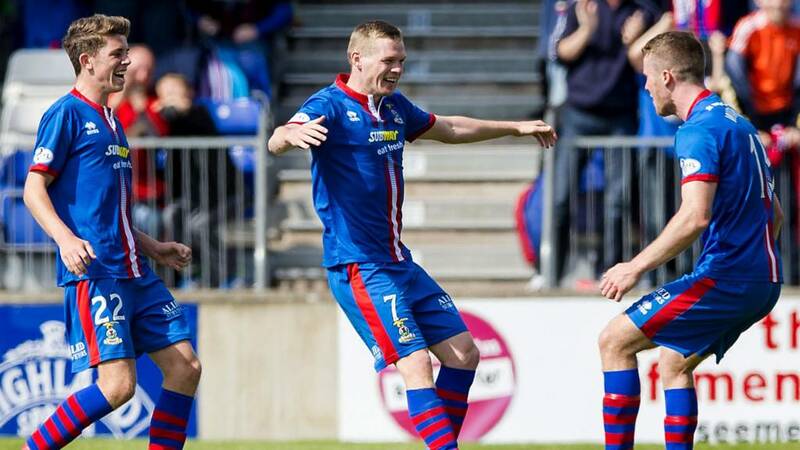 Inverness are looking for their first home win over the reigning champions since May 2011 although Caley Thistle were 1-0 winners in the east end of Glasgow in November 2012. "Ronny Deila always talks about the next game being the most important but it's clear where the priority is. I can understand what he's doing but sometimes players like to keep ticking over." Inverness CT: Brill, Raven, Warren, Meekings, Shinnie, Tansey, Draper, Devine, Watkins, Christie, McKay. Subs: Esson, Doran, Ross, Polworth, Tremarco, Horner. Inverness stick with the side that earned a fine 2-0 win at Motherwell last weekend, while Celtic make no fewer than 10 changes with Tuesday's Champions League play-off in mind. Kris Commons, dropped to the bench for the midweek draw in Maribor, is back in the starting line-up and there are places for teenagers Eoghan O'Connell and Liam Henderson. Both sides are without their regular captains as Richie Foran and Scott Brown battle back from injuries. Good afternoon and welcome to another busy Saturday in Scotland's top flight. We've got a top of the table clash to start with as Celtic visit Inverness CT in the lunchtime kick-off. It's the Highlanders who lead the way, unbeaten in three matches, while Ronny Deila's men have a 100% record but have played a game less. Another five Premiership matches follow at 15:00 BST and we'll dip into the lower divisions with the odd update along the way.